The online gaming industry has been consistently evolving over the past few years in India. The surge in the popularity of online games can be attributed to the easy availability and accessibility of smartphones. The game which has taken the industry by storm since its inception and constantly taking the top spot of the most popular mobile games list is also known as the most famous card game of all time – poker. Now there is no need to travel miles to play your favourite game in live poker rooms. 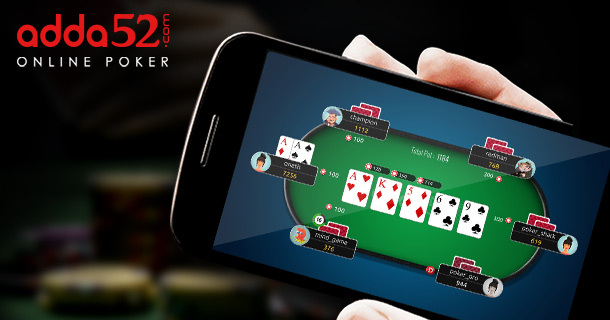 You can just download the poker app on your smartphone and play as per your convenience. Surveys showed that playing mind games like puzzles and card games help people learn how to improve their focus, develop strategies, and make better judgments. There are so many variants and sub-variants of poker available online which a player can choose from as per his knowledge and interest. Poker is an incredible game which not only entertains players but also gives them the opportunity to win good money. You can play online poker with real cash on your smartphones and win great cash prizes. It is not necessary to buy an expensive phone to play online poker. If your device is equipped with required technical specifications, you can easily install the game and play instantly. Playing poker on mobile is less expensive and more comfortable form of entertainment than playing live. You can make money transactions to play games easily through your mobile devices. Online deposit and withdraw process is simple and with just a few taps on your phone, you can transfer money from your website account to bank account in no time. You can use Credit Card/Debit Card/Net Banking to make a purchase through the app. It is a myth that playing online on mobile devices is a wastage of time. The fact is playing poker on mobile devices helps player sharpening their mathematical and problem-solving skills. It is a great mental exercise for those people who are struggling with statistics and calculations. You can also make a great amount of money by participating in online cash games and tournaments. Games download is now much easier and faster than before. If you already have an account on the gaming website, you can get amazing cash bonuses, tournament tickets, or deposit offers by downloading the app. Now comes the million-dollar question: Why Adda52 poker app is the best app to play poker on mobile? You can log in easily to your Adda52 account through the app. The app offers different variants of poker games i.e Texas Hold’em and Omaha. You can participate in cash games and tournaments which are available 24×7 and win guaranteed cash prizes. Adda52 Poker app has been optimized to work with most mobile devices. Also, the website is RNG certified from iTech labs, Australia which ensures random cards distribution and unpredictable game-play. Your mobile is not just a device, it is the magic wand which can do wonders. It has the power to enliven stressed and dejected minds and it is important to utilize this power in the best way possible. So go ahead and download the app right now to play your favourite games anytime and anywhere. Which Avenger are you on a poker table?